Vintage Horse Pin Brooch Faux Pearl Rhinestone Goldtone Vintage Horse Pin Brooch Faux Pearl Rhinestone Goldtone. Tiny Goldtone mounting with Faux Pearls and a Red Rhinestone Eye. The plumed tail dangles with two graduated fauz pearls. Measures approx 7/8 inch tall X 1 1/4 inch wide. Excellent gently worn condition. Top pearl in mane has the paint worn of. This is an elegant looking horse pin. 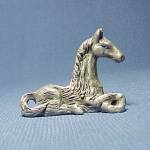 Pewter Horse Pony Miniature Figurine Animal Figure Mini Horse Figural. Shadow box size. Depression Glass Trojan Horse Miniature Mini Figurine Animal Figure Clear glass rearing wild horse. Maker unknown. Marked with a tiny S beside the C inside a Circle. Possibly Cambridge Glass? We have been told by a person in Cambridge that they did make these horses, but only a few. Measures 2 3/8 inches tall x 1 1/2 inch X 3/4 inch. The bottom is partially ground. Nice addition to any glass animal or horse collection.